The challenge this week at Whimsical Wednesday is getting back to basics. First, we weren't allowed to use our Cricut - my first thought was "what?! I don't remember life before my Cricut" lol :). In addition, we had to use an "old school" item like a sticker. I'm not going to lie, I actually had to go out and buy stickers, but wound up having a lot of fun with this challenge. It came out really cute i love the little lady bug. What a cute box! 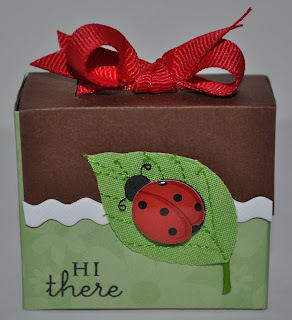 I love the stitched leaf and ladybug! Great job! Great box!!! I hope it is full of chocolates!!! That little bug on the leaf is adorable. I will have to check out the directions to making the box. Roberta, you did an amazing job once again with this challenge. I LOVE that box, something different..never seen that shape before. The colors are so pretty too. The lady bug is just darling too. I had to get stickers at the store too;). OMG.. LOVE it! First I love how you ALWAYS leave where you got the instructions! Thank You! Secondly.. I was laughing because of your post! It is so hard to remember or for some of us didn't start until the Cricut! I LOVE the colors, the leaf and that ladybuG! Just Beautiful! Great job! what an incredible box! i can't believe it's cricutless!!! Great job! This box is just so adorable. I love the colors and that little bug on the leaf is precious. I like the white ric rac that separates the green & brown as well as the red bow. You did great!